Candlenut is a type of herb that has many benefits. Candlenut or Aleurites Mollucana. In addition to be a spices, Candlenut are included in Euphorbiaceae tribe can overcome various digestive problems such as bloody bowel movements, diarrhea, dysentery, abdominal pain, constipation, fever, mouth sores, and toothache. The herb known by western society as the Candleberry, Indian Walnut and Cadlenut, is now widespread in tropical regions. The plant height reaches about 15-25 feet. The leaves are pale green. Peanuts have a diameter of about 4-6 cm. Seeds contained in it has a protective coating that is very hard and contains a lot of oil, allowing it to be used as a candle. In Japan, candlenut tree bark is researched and utilized for healing tumors, and research is still being developed. While in Indonesia and Malaysia, candlenut is transformed into a culinary spice flavor meals. Changing the food to be more delicious. In candlenut, many contained saponins, falvonoida, and polyphenols. Many researchers have proved that these components have a very big significance for health. The content of micronutrients contained in candlenut for example are proteins, fats, and carbohydrates. Potassium, phosphorus, magnesium, and calcium is the dominant mineral in candle nut. It also contains iron, zinc, copper, and selenium, in small amounts. Approximately 53 percent of the candlenut is fat. However, these fats are unsaturated fats that are not only able to reduce levels of LDL, but also prevent blood clots which cause heart attacks and strokes. candlenut other essential ingredients are vitamins, folate and phytosterols that can damage forming enzyme of cholesterol in the liver, thus inhibiting the formation of cholesterol. There are two types of protein in candlenut nut, the essential and nonessential amino acids. One function of the amino acid is an amino acid for growth as found in all tissues and form proteins and antibodies. Nonessential amino acids that prominent in the candlenut, the glutamic acid and aspartic acid. The presence of glutamic acid gives a sense of pleasure in the tongue, so the candlenut, could be an alternative substitute flavoring dishes such as MSG. The oil from the candlenut is an irritant and is used on the scalp to promote hair growth. The pulped seed kernels are used in poultices to relieve headaches, fevers, swollen joints and sores and ulcers on the skin. In Java the bark decoction is given for dysentery, while the hot leaves are used for headaches and gonorrhoea for which purposes they are applied topically to the body. The leaves and bark have been found to have antiviral and antibacterial properties, while the methanol extract of the leaves has hypolipidemic effects. The leaves have pain-killing properties believed to be due to their flavonoids content. The nuts from the tree may be used in cooking as a substitute for macadamia nuts, but should not be eaten raw as they contain saponins and other toxic substances. Candlenut mainly grown for its seeds; which after being processed is often used in Indonesian and Malaysian cuisine. In Java, candlenut is also used as a thick sauce that is eaten with vegetables and rice. 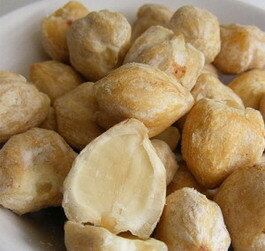 Candlenut is similar in taste and texture with macadamia, which also has a similar oil content. Candlenut also burnt and mixed with pasta and salt to create spices typical of Hawaii, called inamona. Inamona are the main cooking spices to make a traditional Hawaiian poke.